Creating culinary art with food was my first love, it has always been an escape and a way to make people happy. In 2006, I was diagnosed with Type 2 Diabetes. Despite both of my parents and two of my siblings diagnosed with diabetes years earlier, I didn’t really pay much attention to it. Two years later, I began managing four estates for a family in northern California. One of my main duties was working as a private chef. I was able to share my knowledge and expertise in healthy eating, which included menu planning, managing a food budget and cooking with fresh ingredients. 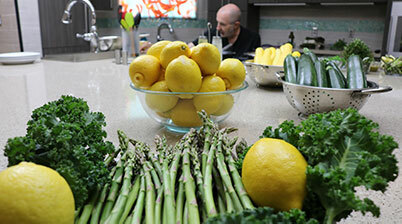 Even though I was cooking healthy foods for others, I was not following those same healthy eating habits. I was working long hours and rewarding myself with unhealthy choices; i.e. fast foods, highly-processed foods, sugar-filled foods, eating late and overindulging. In November 2012, my unhealthy eating habits and lifestyle led to a life-changing hemorrhagic stroke. I was paralyzed on my left side and now use a wheelchair for mobility. Part of my recovery regimen included taking insulin to control my sugar levels. During rehab, I was determined to control my diabetes and change my lifestyle I became obsessed with learning more about menu planning, portion control and sensible shopping. It was then that I really took charge of my health. With these changes, I was able to stop taking insulin altogether, lose 70 pounds and reduce the number of medications I was taking. I was also able to manage my A1C (blood sugar) levels. My doctor even told me my blood work is that of a 35-year-old triathlete. I credit all of these changes to my approach of using food as medicine. While the way I cook has been altered since my stroke, my desire and passion to prepare great-tasting food have not wavered, even slightly. I had to reinvent the way that I prepare my meals and the tools that I use. I learned to simplify my cooking methods. When it came to finding these methods and overcoming challenges along the way, I found encouragement and support in the Living Well with a Disability (LWD) course at Ability360. In 2013, I graduated from the LWD class, and I’ve been a mentor in the program ever since. I strongly believe in this program, as it provided me with a safe environment in which to give and receive feedback. I rediscovered my purpose is to help people learn how to achieve their best in life and live the life they want. Though I now use a wheelchair for mobility, it has never defined who I am or what I do. When I was offered the position of the LWD coordinator in 2017, I welcomed the opportunity with open arms. I approached the position with the same vigor as I approached my pursuit of a healthy lifestyle. Today my diet is 80 percent vegetarian, consisting of plant-based whole foods, wild-caught fish and organic poultry. Of the fish, one of my favorites is wild-caught salmon. Salmon is high in protein and omega-3 fatty acids. Protein-rich foods require more calories (energy) to break them down in the body, which helps us feel full for longer. Omega-3 fatty acids are key nutrients that help in the prevention of heart disease and assist in lowering blood pressure. Fresh, organic produce does not contain pesticides or preservatives, so not only is it fresh, it retains more of its natural nutrients. 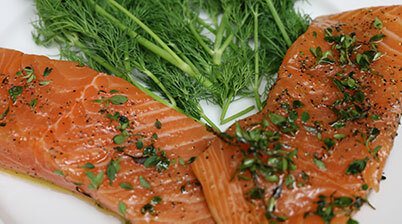 With the arrival of Spring, a fresh bounty of vegetables is available and makes a great accompaniment to salmon. 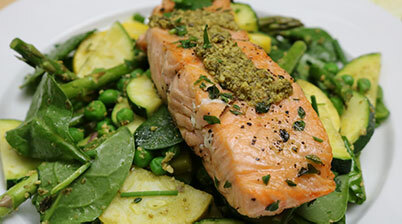 One of my favorite, easy-to-prepare recipes is a Spring pan-seared salmon atop a bed of asparagus, English sweet peas, zucchini and yellow squash. I hope you take some time to prepare this and share it with those you love. I look forward to sharing more about my passion and hearing more about your experiences with this recipe! coarse black pepper; set aside. cut the remaining spear in ½.
slices, then cut the slices in ½.
Wash and drain spinach leaves, then set aside. minutes or until the desired temperature is reached. place on a plate; cover to keep warm and set aside. squash, season with salt and pepper, then sauté for 2 minutes; add peas and spinach plus ¼ cup of water; cover the pan with a lid and cook another 45 seconds; remove pan from stove top, add 1 tablespoon of pesto sauce and mix well. 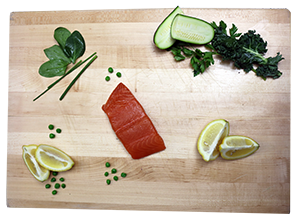 Spoon a serving of vegetables onto each plate, then place a salmon filet on top; squeeze ½ a lemon on top of each filet; sprinkle with fresh parsley and thyme as desired; spoon remaining pesto sauce on top of each salmon filet. 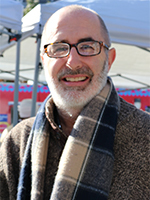 A native of Santa Ana, CA, Steve Norton has been in the hospitality industry for the past 30 years. 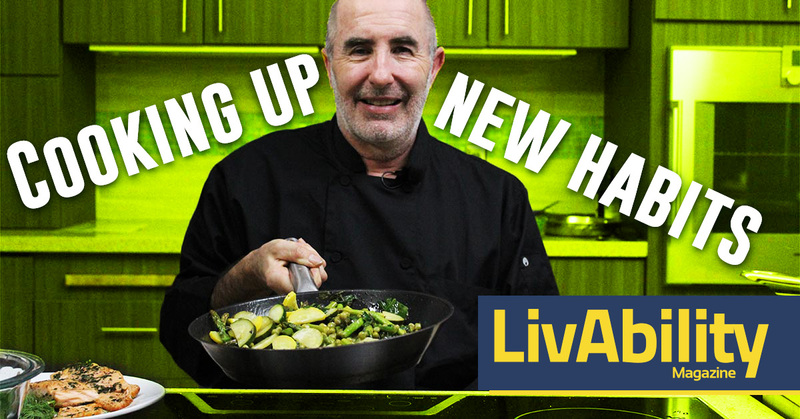 He attended New York’s prestigious Culinary Institute of America and has worked as a private chef. 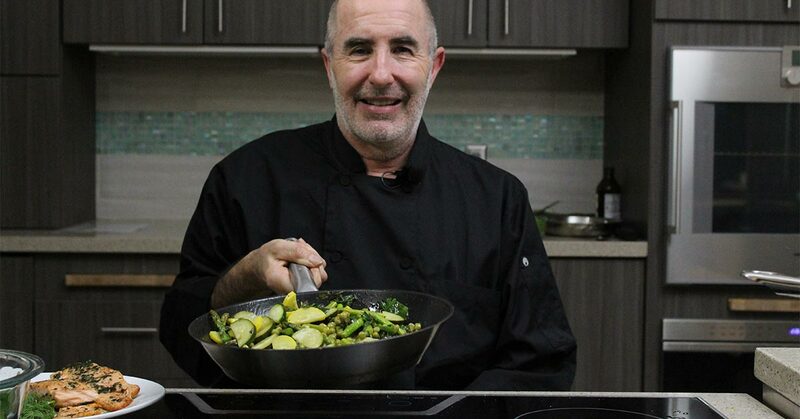 Steve loves to share his knowledge and expertise in healthy eating, including menu planning, managing a food budget, and cooking with fresh ingredients. Read more by Steve Norton.